It goes without saying that a beautiful wood floor gives a room character. You can choose to go with sophisticated, elegant appeal or a more natural and rustic look for a room. With such a wide variety of hardwood options to choose from, it’s important to know what you’re buying and how it will look in your home. A "site-finished" floor is a floor that is sanded, stained and finished after it is installed in your home. We are still installing "site finished" wood floors...they are very attractive, but are the costliest generally speaking and usually involves customers having to leave the home until the project has been completed depending on traffic patterns and access. Traditional maple, birch and oak (if stained) are still the most popular. Walnuts and cherry make beautiful flooring, although sourcing and harvesting logs can bring up the price. When choosing your flooring, keep in mind the grade or quality of the wood. A higher grade is evaluated by little to no imperfections or knots in the wood as well as few color variations. Choosing a wider plank for wood flooring expands the look and size of a room. It also helps to create a more rustic look. Now, more than ever, customers are concerned with sustainable flooring. 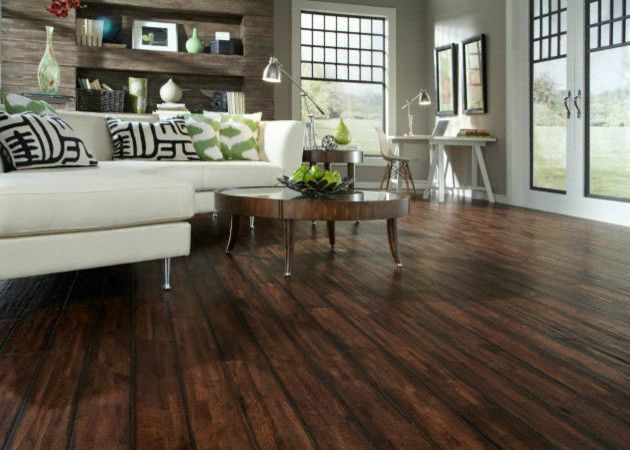 Reclaimed, aged hardwood has become a popular option and gives character and warmth to a room. The wood may have been reclaimed from logs salvaged from lakes and rivers or from old buildings and reprocessed. Lighter colour stains give a room an airy and welcome look. Lighter wood stains can make a room appear cheerier and can achieve a more modern look. Darker stains give your home a more elegant and sophisticated appeal and can also make your space look more stylish and dramatic. Over the last couple of years, stain colours are changing with a movement toward grayer tones. Engineered hardwood is more economical, easier to install, and generally has more durable finishes. Sanding, staining and varnishes can be factory applied and is less susceptible to expansion/contraction movements caused by temperature and humidity changes. Basically it is better wood technology. The new manufactured wood flooring (pre-finished and engineered) can bring in more exotic woods, however the traditional species still are the most common. Deciding what kind of hardwood flooring will work best with your renovation project comes down to your particular taste, style and of course, your budget. When in doubt, we will also help you with your final decision. Call London Renovations Today!